During our trip to old Kijabe yesterday, we visited Dorcas, a member of Pastor Peter's church, a widow who had broken her hip and could not leave her little house. Carolyn, knowing that elderly women tend to get cold, especially elderly women who cannot move around very much, had a coat to give her. It was among a number of pieces of clothing that a group from Carolyn's church in Massachusetts, a group that comes every two years to put on a week long VBS for the children in old Kijabe, had left behind for distribution to the community there. 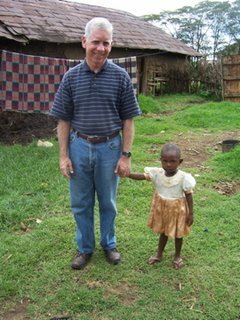 Prior to visiting Dorcas' house, we went by the shamba of one of the elders, Samuel, to drop off the clothes there. (There were several trash and shopping bagsful.) Carolyn asked him if the elders would kindly distribute them to the neediest among the church members and their families, and of course he was happy to do so. But she held back the coat, because she wanted to be sure Dorcas got it and wanted to give it to her herself. 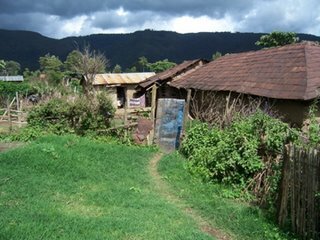 We then walked with Pastor Peter to Dorcas' house, down several paths between small shambas, each of which had one or more mud huts at the edge of an area where corn and other vegetables were planted. We came to Dorcas' shamba, and the first picture shows the entrance. Through the gate one enters an open space in front of the living structures. The second photo shows the entrance to Dorcas' little house, and standing there are two of her granddaughters. 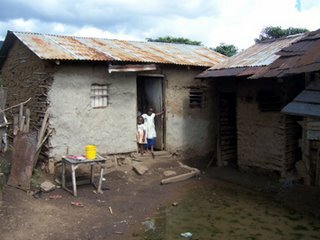 They are the children of her son, who lives in the structure just to the right of the open door. These two children captivated me, especially the little one. When you meet anyone among the Kenyans, the first thing they do is to stick out their right hand to shakes yours. The children, no matter how small, do exactly the same thing. We met these two little ones first. They came out into the yard. I was in the group of Carol, Carolyn, Mary and Pastor Peter, but behind them. As the younger little one approached with her hand out, she started going down the line, shaking each grown-ups' hand, but then she saw me standing behind the others, and she stuck her hand through the line, out of turn, and we shook hands together. When the group of us turned to walk toward Doras' doorway, she grabbed my hand, and I lost my heart. 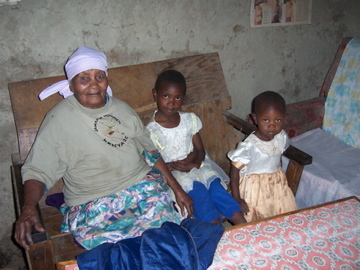 The third photo is in Dorcas' little house, with her two granddaughters. She spoke mainly Kikuyu and Pastor Peter translated. She seemed a woman of great peace, and at one point she said that she was ready to go when God called her. Carolyn gave her the coat and the minister prayed. It was a touching visit. The last photo is of the younger of the two granddaughters and me.